On August 7, 1988, journalist Keith Reinhard disappeared while writing a novel about another man’s disappearance. He has never been found. During the summer of 1988, journalist Keith Reinhard moved to the tiny Colorado mountain town of Silver Plume to write, reflect, and regenerate. With his 50th birthday approaching, Keith was determined to recapture his youth, overcome his fear of heights, and begin writing a novel. 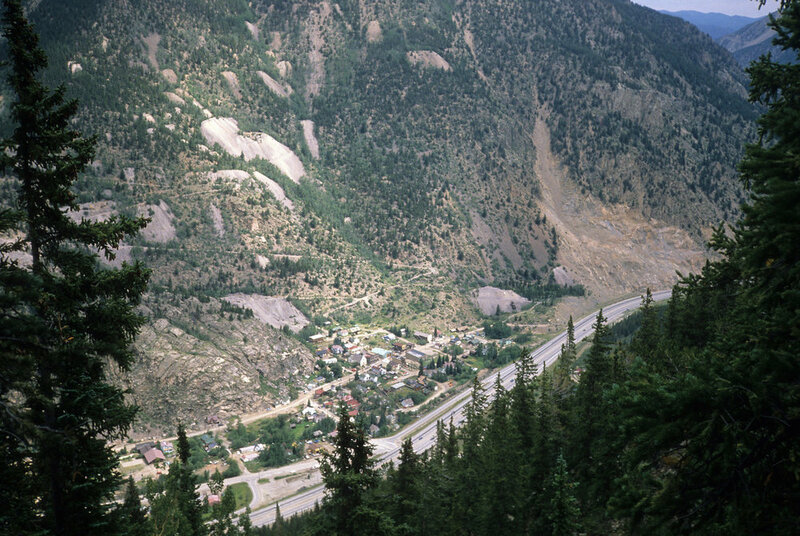 Keith Reinhard was fascinated with the history of Silver Plume - a former mining town haunted by a century-old pattern of bizarre disappearances and death. Reinhard became obsessed with the mysterious disappearance of Tom Young, another Silver Plume resident who vanished the year prior. Young had occupied the same storefront that Keith now operated. Working within these same walls, Tom Young became the basis of Reinhard's novel. At 5 PM on August 7, 1988, Keith closed up his shop for the day, telling friends that he was hiking to the top of nearby Pendleton Mountain - a hike Reinhard knew would take at least six hours. Despite one of Colorado's largest land and air search missions, no trace of Keith Reinhard has ever been found. Today, a series of bizarre speculations, rumors and sinister theories about what actually happened to Keith has given rise to a story of legend in the small community of Silver Plume. Was Reinhard’s disappearance a tragic accident? Or is it possible Keith set up his own disappearance? Did he commit suicide? Was he murdered? Did the disappearance of Tom Young have any relationship to his own? Keith Reinhard attends a party held at the KP Building in Silver Plume, Colorado. He is seen talking with an unidentified female. Despite having a known fear of heights, Reinhard tells Silver Plume residents he's going to hike to the top of Pendleton Mountain, a 12,500 foot peak. Keith was last seen leaving town at 5 PM. Keith Reinhard is reported missing. Colorado’s Alpine Rescue Team launches a massive search and rescue mission on Pendleton Mountain. Reinhard’s unfinished novel is discovered on his personal computer. 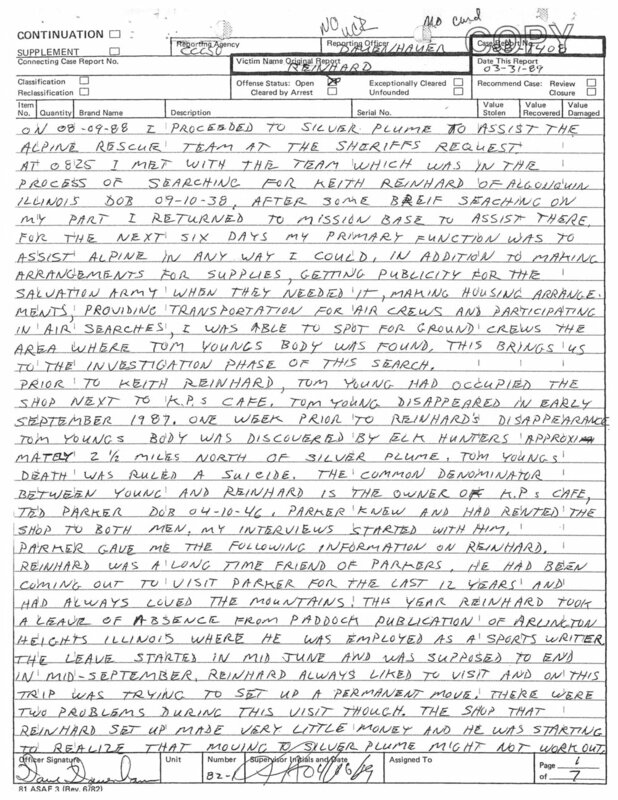 The final paragraph sounds like a description of his own disappearance. 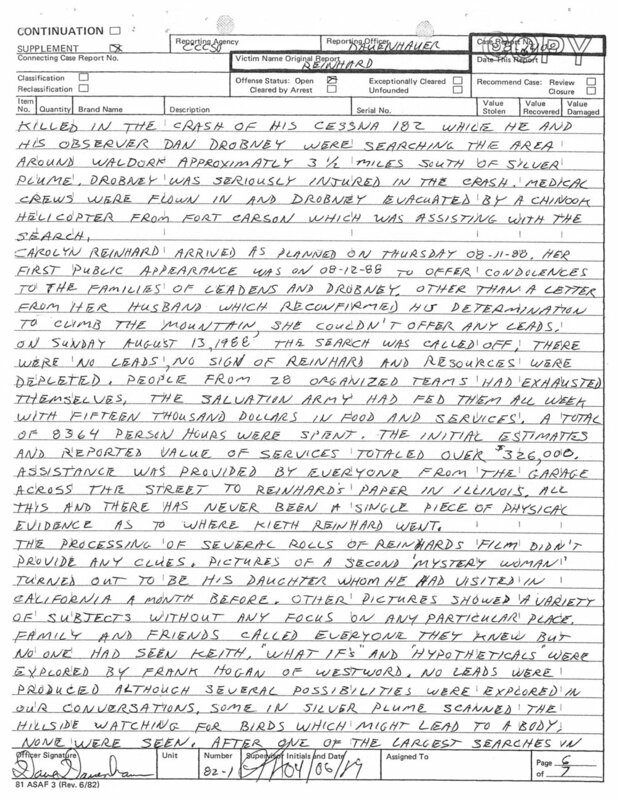 During an air search, a Civil Air Patrol plane crashes into Pendleton Mountain killing the pilot, Terry Leadens, and badly injuring the spotter, Don Drobny. After sevens days, the search for Keith Reinhard is called off with no resolution. It was the largest search and rescue mission in Colorado's history. Unsolved Mysteries airs a segment on the Reinhard story, focusing on speculation Keith may have staged his disappearance. Police receive 270 calls from across the country, but no evidence is found. Production of Dark Side of the Mountain begins in Silver Plume, Colorado. Dark Side of the Mountain explores the mysterious disappearance of Keith Reinhard and the dark historical legacy of Silver Plume, Colorado. With personal insight from Reinhard’s letters, notes, and manuscripts, Dark Side of the Mountain paints a vivid reconstruction of Keith’s unfinished novel in his own words – writings that have been lost for over three decades. Working with original case investigators, the film retraces Keith Reinhard’s last known steps in an attempt to solve this mountain mystery. Dark Side of the Mountain is the chilling true story of a man whose mysterious disappearance blurs the line between fact and fiction. Eric Walter is a director, editor, and documentary filmmaker in Los Angeles, known for producing investigative non-fiction films, including his award-winning feature My Amityville Horror, which was named one of the top 10 festival horror films of 2012. He has produced and consulted on numerous documentaries for film and television with a focus on cold cases and unexplained phenomena. Dark Side of the Mountain is his second feature documentary. Christine Irons is an Austin native now residing in Los Angeles. She started producing with the "Wrecked" segment of the film, Six in Austin. She was also a producer on the award-winning indie, Sexless. Christine co-produced the documentary feature, My Amityville Horror, released by IFC Films. When not producing features, Christine works in unscripted television with a focus on true crime. Lexy Altman is a Southern California native with eight years of experience in film and television. She currently works in non-fiction television and documentary development at Condé Nast Entertainment. Previously, she has worked at Red Wagon Entertainment as well as under director Garry Marshall. Rebecca Breithaupt was raised in the Midwest and is drawn to capturing the unique stories of salt of the earth people through creative nonfiction. Rebecca’s first documentary feature, My Amityville Horror, opened to favorable reviews both domestically and internationally, and her documentary series, Straight White Guy Listening, is currently in post-production. In addition to her film work, Rebecca is the Device Producer at Ayzenberg Group, creating online content for all things Microsoft including HoloLens, Surface, Education, Edge and Band among others. 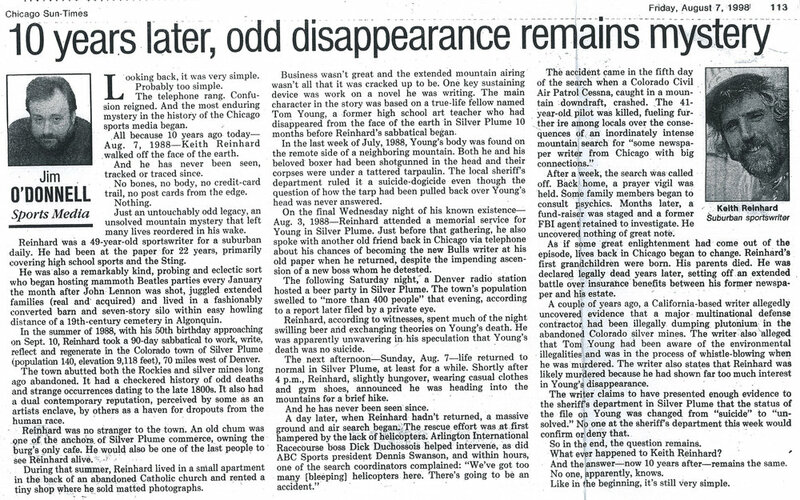 Thirty years ago today, Daily Herald sports writer Keith Reinhard vanished without a trace from Silver Plume, Colorado. He has never been found. Burt Constable reports on our efforts to solve this mountain mystery with our upcoming documentary, Dark Side of the Mountain. CBS Denver investigator Rick Sallinger covered the mysterious disappearance of Keith Reinhard in 1988. Now three decades later, Rick returned to the site of the massive search. The film is currently in post-production. Stay connected to our social media for official updates. If you have any additional questions about our film, feel free to send us a message. If you have any information or know the whereabouts of Keith Reinhard, please contact the Clear Creek County Sheriff’s Office at (303) 679-2376.